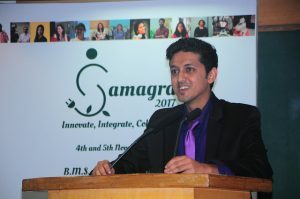 Organized by the Melton Foundation and BMS College of Engineering from November 4-5, Samagra 2017 provided tools, resources and the impetus to Innovate, Integrate and Collaborate at the intersection of Technology, Sustainability and Social Innovation and to explore novel ways of tackling today’s global challenges – starting in Bangalore. Mourya Basavaraj, Melton Fellows and BMSCE graduate, hosting the Samagra 2017 Springboard Sessions. The conference featured Springboard Sessions with six inspiring speakers who shared their impact story together with personal accounts from their journey as change agents. In five workshop, resourceful facilitators brought an abundance of ideas to share, experiences to recount, and oodles of enthusiasm. In addition to the conference giving future change makers a boost in the right direction, it also served as a safe-space for creative ideas to flow, without the fear of judgement. The workshop Design Thinking for Positive Change hosted by Melton Fellows Lisa Günther and Pooja Channaveerappa. Rajagopalan, an enthused attendee at Samagra 2017, expressed that he found the environment at the conference to be lively and wonderful, and that his Workshop Facilitators were very bubbly. 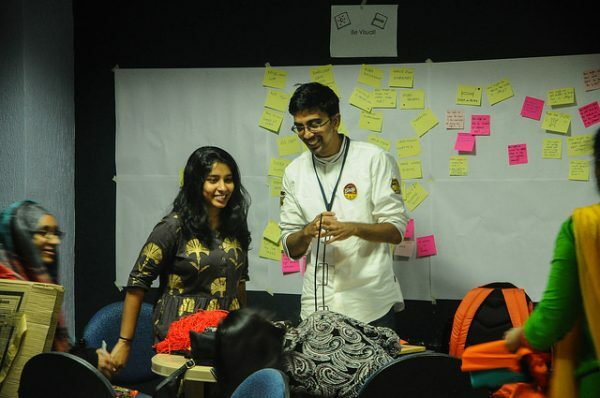 He said that the workshop Design Thinking for Positive Change which he was a part of, was constantly abuzz, in turn never letting the participants’ minds stay idle. He conveyed that he learned the importance of being open to new ideas, while working as a team. He summarized that “the conference helped me gain new perspectives and meet new people”. Abby TerHaar and Shehzia Lilani from The Amani Institute explore The Future of Work with students. Another participant, Yusuf, a recent graduate of BMS College of Engineering, said that the Springboard sessions were very inspiring, and made him want to reevaluate the career path he was choosing for himself. One of the workshops he attended was The Future of Work: Building a meaningful and global career in the 21st century, through which he got to explore his career options and interact with a diverse set of people. Overall, Yusuf found that he was able to express his ideas freely, because the atmosphere at Samagra was extremely conducive to learning. And then there were other workshops that unpacked strategies and tools for green economics, sustainable food production, as well as innovation for marginalized communities. 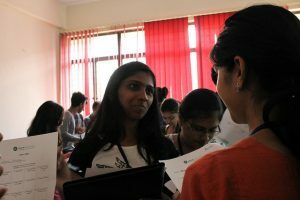 All in all, close to 100 young women and men from across Bangalore seized the opportunity to explore the converging fields of technology, sustainability and social innovation through a global citizenship lens. The general consensus among the participants was that the conference had surpassed their expectations, and that the two days flew by in the blink of an eye! Melton Fellow Wen Xiaozhuo facilitating the Sustainable Food Production workshop. 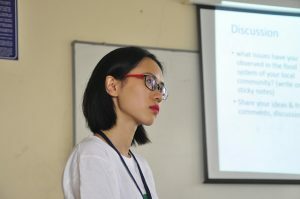 When asked what opinion she had about Samagra 2017, Wen Xiaozhuo, a graduate of the Zhejiang University (China), and the facilitator of the workshop Sustainable Food Production, she said that she was deeply touched by the participants’ enthusiasm and their eagerness to learn from, share their experiences and connect with her. She expressed that she found more similarities, rather than differences between Indians and the Chinese, as a result of which she felt right at home during the conference! Participants of the workshop Innovation for Marginal Communities, hosted by Melton Fellow Tito Magero, in action. Tito Magero, the facilitator of the workshop Innovation for Marginal Communities, loved the energy every participant, workshop facilitator, and Springboard Session speakers carried with them. He found that no one was solely teaching because everyone had something to learn from every individual. He said that not only did he give the participants of his workshop an idea of how to innovate in developing countries such as India, Ghana and Kenya, but he took away a good chunk of knowledge about the innovations taking place in India as well. He said that he feels even more equipped to facilitate innovate in his communities following the conference. Independent filmmaker Vaishnavi Sundar raising the question about one’s true calling at Samagra 2017 Springboard Sessions. 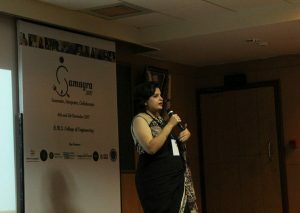 Vaishnavi Sundar, an independent filmmaker, a feminist and a speaker at Samagra Springboard Sessions, experienced the crowd responsive and engaging. She said that she found it delightful to see young participants appreciating and acknowledging the points she was making. She was of the opinion that having people belonging to various cultures, in one place, opened up pathways to new perspectives and ideas. A part of her – so Vaishnavi – wishes that she were a student at BMSCE, getting to attend Samagra 2017! Before concluding the conference on the evening of November 5, participants develop own ideas of how they can actively tackle pressing issues in their communities. 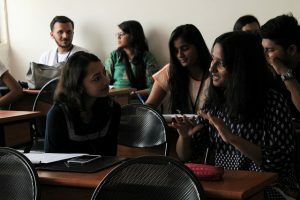 During the ‘Connecting the Dots’ sessions, they formed groups based on their area of interests and pooled in all the knowledge they had gathered over the course of the two days. 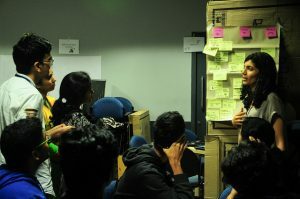 One of the teams came up with the idea to create an app to report psychological abuse, others identified simple means for local communities to be more sustainable or formulated ideas to promote responsible ways of raising and educating children. Thus, by forming these project groups, Samagra 2017 served as an impetus for sustainable, social change in the issues experienced at a global scale. Overall, all the participants, workshop facilitators and Springboard speakers found Samagra 2017 to be deeply enriching, insightful and a whole lot of fun. We are confident that the initiatives sparked at the conference will speak for itself! Hungry for more? Check out our Flickr page for the Samagra 2017 photos diary!